Herbie passed away in his adoptive home after a series of bouts with stasis and bloat. He was greatly loved by us all and will be missed by his mate Princess Priyana and his adoptive humans, Ryan and Jessica who adored him. We loved you Mr. Herbie! 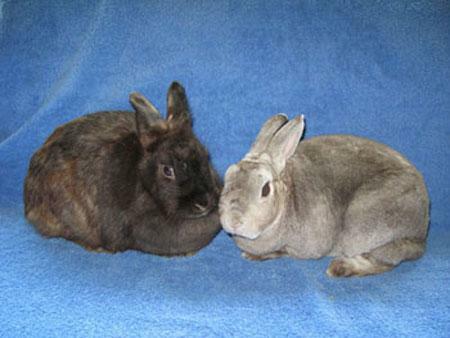 In early 2007,Princess Priyana (the beautiful brown bunny shown here with her gray rex, Hus-bun, Herbie)was found motionless in an industrial area near Highway 101 in San Jose covered with mites and severely malnourished. Mites and fleas had eaten away most of her fur and crusted her eyes and ears closed. Yet amazingly, Princess Priyana had a strong will to live. At first, the extent of Princess Priyana's neglect was so severe that we were unsure if she would survive.Not only did she survive extreme neglect by peole, but also a long, nearly fatal battle with chronic ear abscesses. Just look at how beautiful she looks and happy she is with her hus-bun Herbie, who we took in from Marin Humane Society. Herbie is a handsome, shy, neutered mini-rex boy. Herbie's a small ,very handsome, smokey pearl gray boy with thick plush fur. He's kind of serious. Both he and Princess Priyana are a little shy at first, but a great match for someone who appreciates the quiet grace and stillness of an introverted bunny. Princess Priyana and Herbie love each other very much and must be adopted together. Many thanks to Auntie Heather of The Rabbit Haven for her help with Princess Priyana! Princess is really starting to look pretty, don't you think! Her fur is growing back and she no longer has itchy and painful mites. However, her ear is still infected with an abscess.Her medication was increased to include injectable antibiotics. Her ear is very inflamed and right now it doesn't look like her ear will imrpove without surgery. She will go to the vet this week and we will let you know ASAP about next steps. Thanks for checking back about her! In the meantime, thank you so much for caring about her. She feels very safe and loved! Princess Priyana developed an abscess in her ear that continued to be painful, swollen and infected despite daily medication and regular ear flushes at SaveABunny. So, on Saturday, March 2, she joined Phoenix on a trip to Dr. Debra Scheenstra to have her ear area anesthetized, deeply lanced and flushed. Still, Princess continues to look better each day. Just look at how glamorous she is starting to look! Dr. Scheenstra opened up a larger section of the outer ear, so that the infection could be reached and the ear irrigated. Each day Princess's medical routine takes about 45 minutes. First we give her pain medicine before inserting a plastic needle to flush the wound with sterile saline. Then we give her antibiotics and ear drops containing Baytril and Silvadene to sooth the area and help it heal. Princess is a very sweet rabbit, but it is clear that she doesn't like the ear treatments. She flinches and it seems very uncomfortable. We do our best to help her relax by talking with her and letting her know what we are doing and why. She is very responsive to being talked with and loves to get a lot of attention. She's becoming quite a beautiful rabbit. Thank you for your compassion and support. Watch here for more pictures soon! Priyana is regal and self-composed with a strong will to live. Per her request, we have renamed her Princess. She has improved a great deal since she arrived a few weeks ago and the fur mites are gone. Her fur is beginning to grow back and she has put on weight and regained her strength. The main issue we are dealing with now is an abscess in Princess's ear that is both very painful and potentially dangerous if it turns septic---meaning the infection goes through out her system. We have increased her medication and flush her ear area, but we may need to add injectable Penicillin , which is safe in most rabbits, but can cause a fatal reaction in a rare case. We have been reluctant to add Penicillin, because of the potential risk, but may need to do so if she doesn't show improvement in the abscess very soon. Princess is a very brave and special rabbit. We love her and we are doing everything we can to help her heal. We will keep you posted on her progress. This critically injured girl arrived at SaveABunny thanks to the watchful eye of Heather at The Rabbit Haven who spotted her at the San Jose Animal Services. Heather named this girl Priyana, which means "loved one" and SaveABunny and The Rabbit Haven worked together to have Priyana seen by a vet and transported to SaveABunny for long-term intensive care and healing. Priyana was found motionless in an industrial area near Highway 101 in San Jose covered with mites and severely malnourished. Mites and fleas had eaten away most of her fur and crusted her eyes and ears closed. Yet amazingly, Priyana had a strong will to live and in the few short days she has been in rescue her progress is touching. Last night she sat up and groomed herself! The extent of Priyana's neglect is so severe that her prognosis is extremely guarded and her recovery, if possible, will take several months. She will remain at SaveABunny for as long as it takes for her to get the psychological and medical healing and special care that she needs to survive and thrive. Please watch our website regularly for updates. If you would like to donate to help Priyana, we would be extremely grateful.